Bagan, Myanmar (Burma), aerial view of air balloons floating over the ancient temples and pagodas at sunrise. The Bagan Archaeological Zone is a main draw for the country's nascent tourism industry. hd00:14Balloons float through the sky. Tourists from around the world come to Cappadocia to tour the balloons. 4k00:08Red balloon in the shape of a wheat heart.Aerial view:Hot air balloon in the sky over a field in the countryside in the beautiful sky and sunset.Aerostat fly in the countryside. 4K video,ultra HD. 4k00:07GOREME - OCTOBER 2013: Lots of hot air balloons flying over the unique rock formations, the fairy chimneys and rock-cut houses in Cappadocia, Goreme, Turkey. hd00:27The great tourist attraction of Cappadocia - balloon flight. Cappadocia is known around the world as one of the best places to fly with hot air balloons. Goreme, Cappadocia, Turkey. hd00:23BAGAN, MYANMAR - MARCH, 2014:air balloons over the ancient Buddhist temples in Bagan, Myanmar on March, 2014. 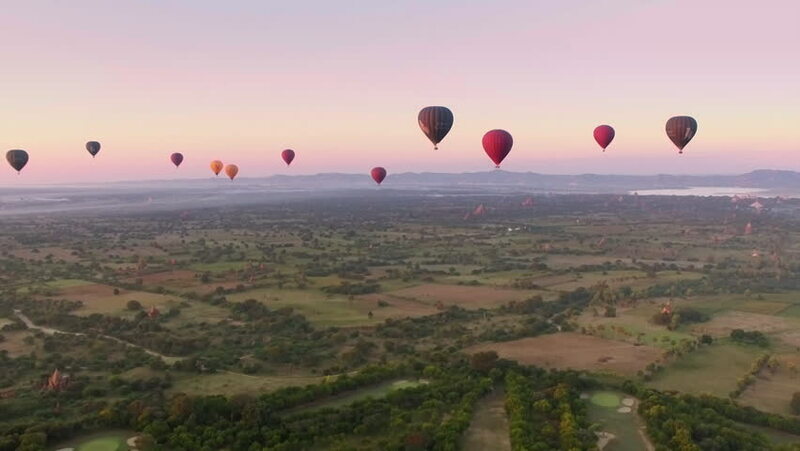 Ballooning becoming increasingly popular when visiting ancient Bagan in Myanmar.